Gary Cooper had made a reputation in a variety of film genres in the 1920s and 1930s, including upscale westerns. By the 1940s he was among the biggest stars in Hollywood, and he only made four westerns during the decade: The Westerner and North West Mounted Police in 1940, Along Came Jones in 1945 and Unconquered in 1947. 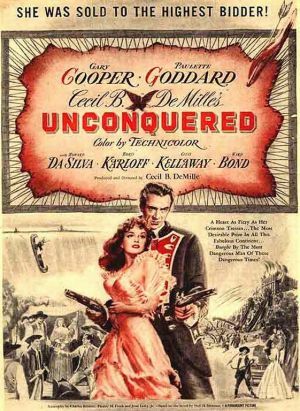 North West Mounted Police and Unconquered were not the low-budget productions typical of the genre then. 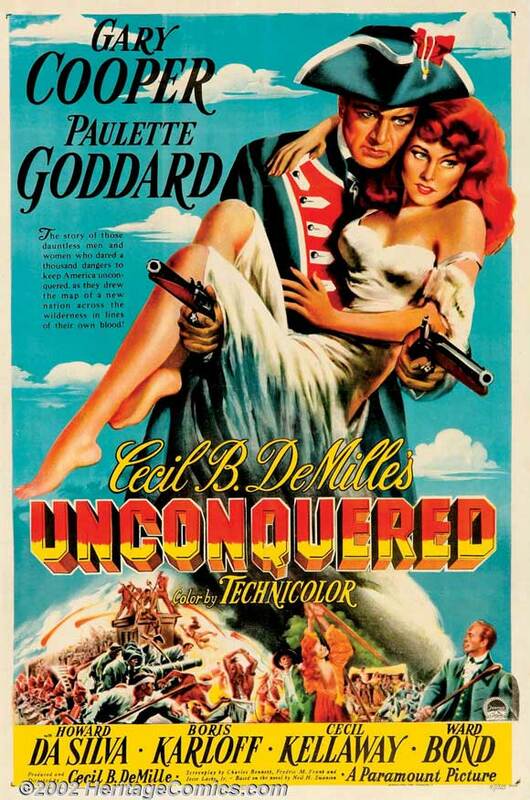 They were directed by Cecil B. DeMille, and Unconquered was DeMille’s usual self-conscious epic, made with a large budget, in color and with a long playing time of 146 minutes. Unconquered begins in 1763, the time of Pontiac’s Uprising in the northwest frontier of Britain’s American colonies, more than a decade before the Revolution. 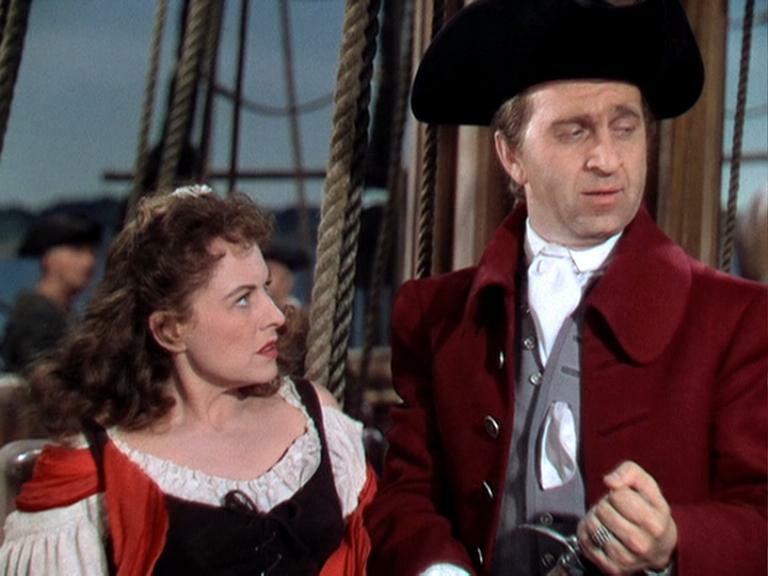 Comely young English woman Abigail Hale (Paulette Goddard) is sentenced to death or transportation to the colonies in indentured servitude for helping her dying brother resist impressment into the Royal Navy. She chooses transportation. As the ship carrying her and other convicts nears the colonies, Abby attracts the interest of smooth but nefarious Indian trader Martin Garth (Howard Da Silva), who bullies the slave trader on the ship into auctioning her prematurely. Unexpectedly, she is bought by Virginia militia Capt. Christopher Holden (Gary Cooper, not young at 46), who distrusts and wants to frustrate Garth. Holden arranges for her to receive her freedom when he leaves the ship the next day, since he’s meeting his fiancée. Abby (Paulette Goddard) catches the eye of Indian trader Martin Garth (Howard Da Silva). Holden’s plans go astray. His fiancée Diana (Virginia Grey) reveals that she has married Holden’s brother, and Garth bullies the slave trader into giving him Abby’s freedom papers and reselling her to his henchman Bone (Mike Mazurki). 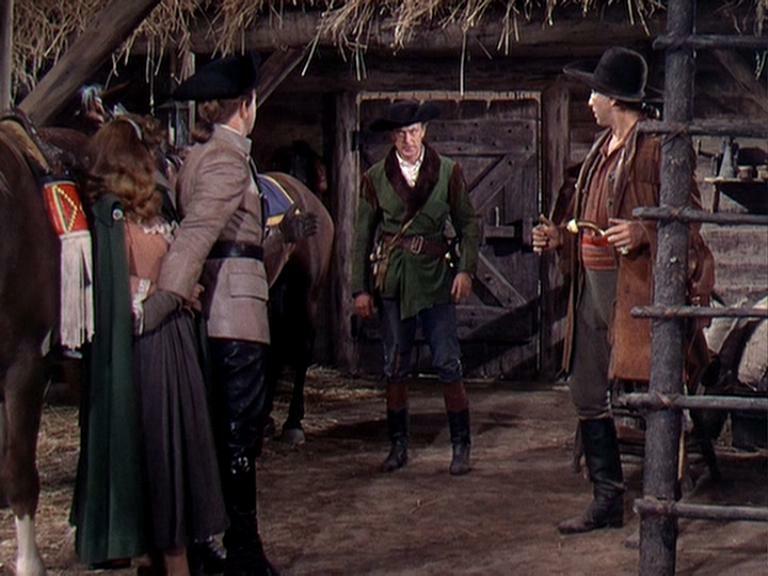 Holden ends up inland at the Peaketown Fair, where he meets his blacksmith friend John Fraser (Ward Bond), sees Abby again, meets with Col. George Washington (Richard Gaines) and Sir William Johnson, the King’s premier Indian agent. They hear of Pontiac’s plans to inflame the northwestern tribes (western Senecas, Shawnees, Ottawas) in the western Pennsylvania, Ohio and Michigan areas. Holden agrees to carry wampum belts inviting the chiefs to a meeting, although he knows Garth’s Indian allies will be trying to kill him. They do get his two scout comrades, but Holden makes it to Fort Pitt in western Pennsylvania. There he finds the garrison is both depleted and reluctant to believe him. He also finds Abby working in Bone’s tavern, and he abducts her to use as bait for Garth. At a ball, Holden manages to challenge Garth to a duel, but Garth and Bone make off with Abby to the camp of Guyasuta (Boris Karloff), chief of the western Senecas and Garth’s father-in-law. They leave Abby with Guyasuta, but his warriors and women begin to torture her. Holden finds her and uses apparent magic (gunpowder explosions, a compass) get her released. Pursued by Guyasuta’s warriors, they head downriver in a canoe, shooting rapids and going over a waterfall where Holden arranges a wildly improbable grab of a conveniently overhanging tree branch just in time. 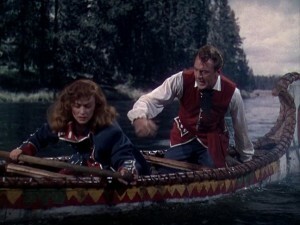 Abby (Paulette Goddard) and Holden (Gary Cooper) head for the falls. As they make their way to the fort at Venango, Holden and Abby find evidence of Indian raids and slaughtered settlers. At Venango, evidence suggests that the fort surrendered when given promises of mercy but the inhabitants were slaughtered by the Indians anyway. However, the garrison at Fort Pitt refuses to believe them, and Holden is court-martialed and imprisoned. Abby promises Garth she’ll stay with him if he’ll arrange for Holden’s escape. He does, but also arranges for sharpshooters to ambush Holden during the escape. Garth’s spurned Seneca wife Hannah (Katherine DeMille, Cecil’s daughter) re-directs Holden but is shot herself. Holden makes it to Col Henry Bouquet at Bushy Run looking for reinforcements for Fort Pitt, but finds Bouquet’s ranks depleted, too. He arranges to borrow Bouquet’s drummers and pipers and a hundred dead men, using them to feign a relief column to chase off the Senecas now besieging Fort Pitt just as Fort Pitt is on the verge of surrendering as Venango did. As Garth and Bone try to escape with Abby, Holden catches them in a stable and finally shoots it out with Garth. Holden (Gary Cooper) has it out with Garth (Howard Da Silva), as Bone (Mike Mazurki) and Abby (Paulette Goddard) look on. Although this is watchable, it has a few elements that don’t work well with modern audiences. The color cinematography by Ray Rennahan is excellent. The heavy-handed introductory narration and the dialogue can be clunky, and the Indians are mostly evil stereotypes, as one might guess from the casting of Karloff. Some critics at the time referred to this as “The Perils of Paulette,” because of the way she seems to move from crisis to crisis. The production design is good; DeMille gets the uniforms, forts and firearms right. Cooper and Goddard are both a little old for their roles, but they work well enough. Goddard had several fights with DeMille during filming, and he would never cast her again in one of his movies. Her accent in this film is decidedly not English. 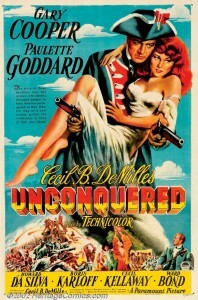 This was also the last of Cooper’s four films with DeMille. Howard Da Silva makes an excellent villain. In his memoirs, DeMille said that he was not completely satisfied with the ending and thought it needed to be stronger. By this time, Cecil B. DeMille had been making westerns for more than thirty years, since The Squaw Man in 1914, the first feature-length movie of any kind. This was his last western, but not his best. Both The Plainsman (1936) and Union Pacific (1941) are watched more than North West Mounted Police (1940) and this. 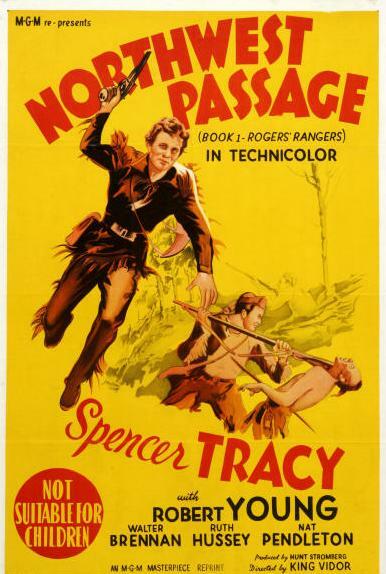 Unconquered was based on Neil Swanson’s novel The Judas Tree; he also wrote Allegheny Uprising, another colonial-period western starring John Wayne and Clair Trevor. The river scenes were shot on the Snake River in Idaho, and look very good. Iron Eyes Cody is both in the cast and listed as an Indian language consultant, but we now know that Cody, despite making a career as a cinematic, advertising and television Indian, was in fact the son of Sicilian immigrants. Guyasuta (Boris Karloff) with daughter Hannah (Katherine DeMIlle); and Cecil B. DeMille directs Paulette Goddard in her bath scene. Although Pontiac never actually shows up in this film, the traditional historical work on his wars is Francis Parkman’s The Conspiracy of Pontiac, first published in 1851 but still readable. Guyasuta was not the unrelievedly evil character depicted here although he consistently opposed the expansion of American settlement in the Ohio country. 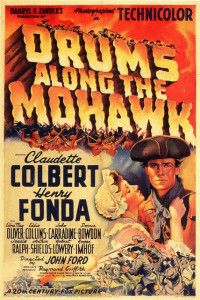 For a recent biography see Brady Crytzer’s Guyasuta and the Fall of Indian America (2013), which not only describes his role in Braddock’s defeat, Pontiac’s uprising and the Battle of Bushy Run as mentioned in this film, but takes him all the way up through the American Revolution and the Battle of Oriskany (see Drums Along the Mohawk) to his participation in the Indian defeat at the Battle of Fallen Timbers in 1794 by Mad Anthony Wayne. For a description of the situation on the American frontier in 1763, see Colin Callaway’s The Scratch of a Pen: 1763 and the Transformation of North America (2006). 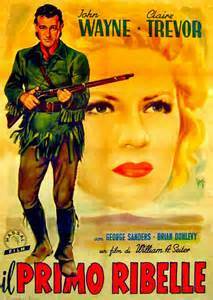 This entry was posted in Westerns Worth Watching and tagged Cecil B. DeMille, Colonial Westerns, Gary Cooper, Native Americans (Indians), Selling Guns to the Indians, Ward Bond on November 17, 2014 by Nicholas Chennault. Based on Walter D. Edmonds’ 1936 best-seller of the same name, this is the story of life on the frontier in the Mohawk Valley of upstate New York during the American Revolution. 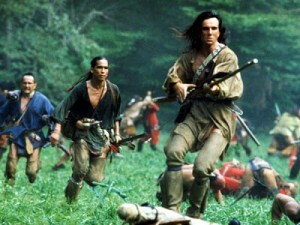 Whereas the Iroquois tribes and the British had been allies of the American settlers during the French and Indian War of the late 1750s (the setting for the events of Last of the Mohicans), they are now the enemies of the Americans trying to assert their independence from the British. The movie opens with the marriage in Albany of Gil Martin and his new bride Lana in 1776. The same day they move on toward his new farm near Deerfield in the Mohawk Valley. 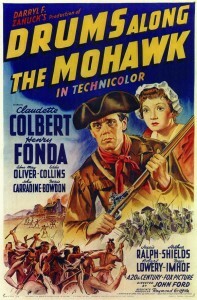 Lana is taken aback at the rustic nature of his cabin and the sudden terrifying appearance of an Indian, who turns out to be Blue Back, a friend and a “good Christian.” Lana meets neighbors at the nearby Fort Herkimer in German Flats, and Gil takes his place in the militia commanded by Gen. Nicholas Herkimer (Roger Imhof). The young couple heads west from Albany. As the neighbors are helping Gil to clear his land, the farm is attacked by Indians led by one-eyed Caldwell (John Carradine), a Tory. The farm and crops burn and the settlers straggle to Fort Herkimer, where Lana suffers a miscarriage. 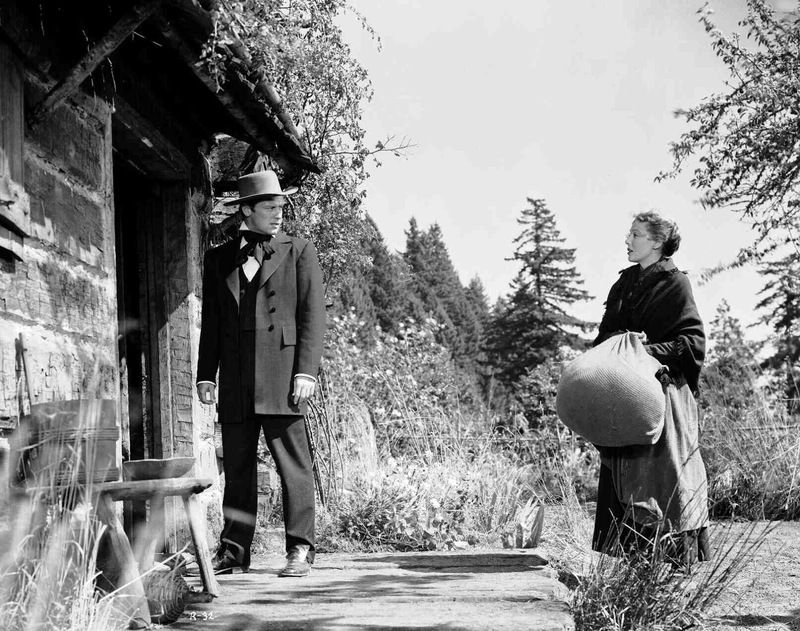 With no farm, the Martins hire on to work for the widow Mrs. McKlennar (Edna May Oliver). Soon Gil leaves with the militia, and after the Battle of Oriskany, they straggle back. The Americans have won, but at a cost. Gen. Herkimer is wounded in the knee; his leg is amputated but he dies from blood loss. Gil is wounded but survives. Lana is expecting again. 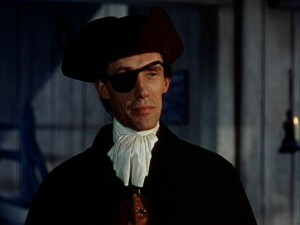 The enigmatic and serpentine Caldwell (John Carradine). Tories and Mohawks attack German Flats, and the settlers again take refuge in Fort Herkimer. Mrs. McKlennar is mortally wounded, and powder and ammunition run low. Gil escapes and runs toward Fort Dayton for reinforcements, followed by three Mohawks. Those in the fort are pressed hard, as the Mohawks force the gates and attack the church where the women, children and last defenders are holed up. At the last moment the regular army from Fort Dayton appears, the Mohawks are vanquished, Cornwallis has surrendered to Washington, and the new nation is born. The implication is that Blue Back has killed the Tory Caldwell. Mrs. McKlennar has left her place to the Martins, and they resume the life they had planned in 1776. The film has covered a period of about five years without being very specific about the passage of time. This was director John Ford’s first film in Technicolor, made right after Stagecoach and Young Mr. Lincoln. You can see elements of his developing visual style in shots with a two-wheel horse-drawn cart along a ridge against a looming sky, and with the three Mohawks pursuing Gil outlined against a red sunrise as they crest a ridge. 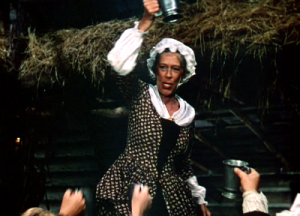 The Widow McKlennar (Edna May Oliver) buys a round; Lana holds off the savages. The strength of this movie is in several strong performances by supporting characters, starting with Edna May Oliver as the forthright Mrs. McKlennar. Roger Imhof is an avuncular Gen. Herkimer with an appropriately German accent. Arthur Shields is good as Rev. Rosencrantz, the German Flats pastor, and Chief John Big Tree is excellent as Blue Back, the Christian Indian. Big Tree had been in 1924’s The Iron Horse and Stagecoach (1939), and will show up again in She Wore a Yellow Ribbon as an old Cheyenne friend of Capt. Nathan Brittles. In fact, he was a Seneca who was in 59 films between 1915 and 1950. Ward Bond is effective as Adam Hartman, Gil’s close friend in the militia, and John Carradine is a good but shadowy figure as the villainous one-eyed Tory Caldwell, apparently based on the Tory leader Walter Butler. John Ford’s brother Francis plays an aging scout captured by the Mohawks and torched in a wagon filled with straw. There’s lots of Technicolor fire in the movie. Gil Martin races Mohawks against a Technicolor sunrise. This film was a big success at the box office in Hollywood’s greatest year ever. 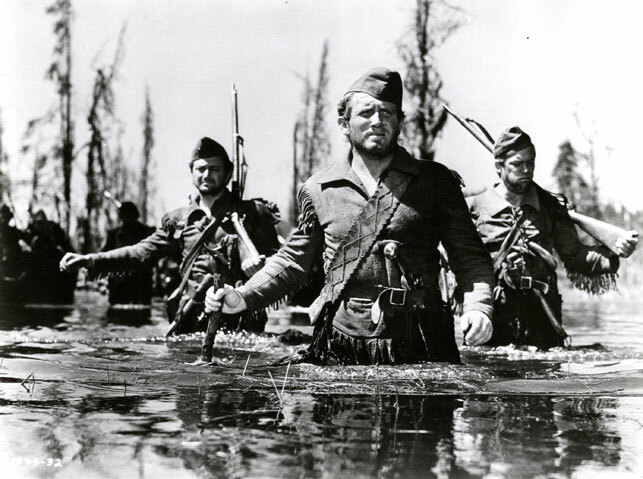 Ford had planned to spend three weeks in filming the Battle of Oriskany at great expense, but studio head Darryl Zanuck ordered him to find ways to cut the expense. The battle and its results are narrated effectively by the wounded and delirious Gil as he receives medical care at the Widow McKlennar’s farm. 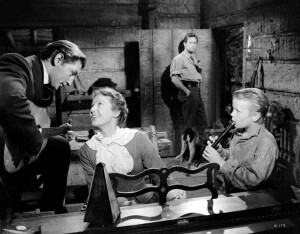 The screenwriter was Lamar Trotti, who also wrote the screenplays for Young Mr. Lincoln and The Ox-Bow Incident. 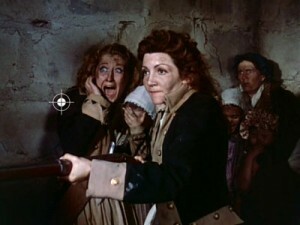 The film was nominated for Academy Awards for Best Supporting Actress for Edna May Oliver’s performance as the Widow McKlennar and for Best Cinematography. Music is by Alfred Newman. Filmed in Cook County, Pennsylvania, and even in southern Utah, but Monument Valley doesn’t show up. As with Gone With the Wind, 1939’s biggest movie, there are a few attitudes that can seem archaic to modern tastes. Lana’s a little too hysterical initially for modern feminist sensibilities. The Mohawks are faceless, menacing savages. The alcoholic comic relief doesn’t play as well now as it did then. 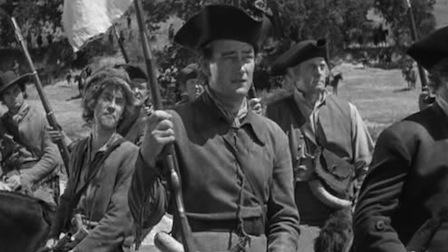 And John Ford’s pre-World War II unquestioning patriotism is on display as the new nation is born at the end. Still, it’s a mistake to expect a movie from 75 years ago to conform to more modern social attitudes. On its own terms, it’s pretty good and eminently watchable. The film’s sense of community among those living on the frontier, based around a church, is quite good. 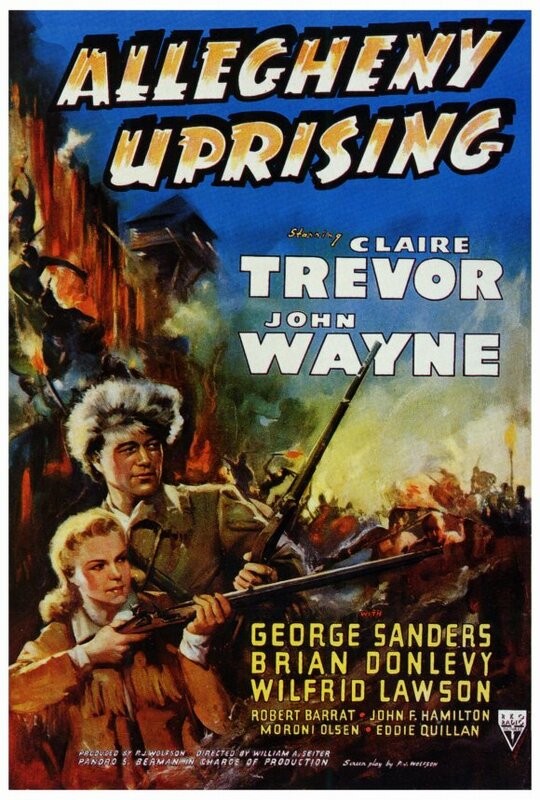 The American Revolution has seldom worked well in movies, and this is one of the best of such films. It would have been nice to have a little more background on the Mohawks and other Indians involved, as well as the enigimatic Tory Caldwell. That wasn’t done much in 1939, and the movie budget and pacing probably wouldn’t have allowed for it anyway. If you want more information on the actual history of this branch of the American Revolution in Iroquois country, see Glenn F. Williams’ Year of the Hangman: George Washington’s Campaign Against the Iroquois (2006). The title refers, a bit sensationally, to the year 1777, when the Battle of Oriskany took place and the 7s were thought to resemble gallows. But the scope of the book is much broader than that. 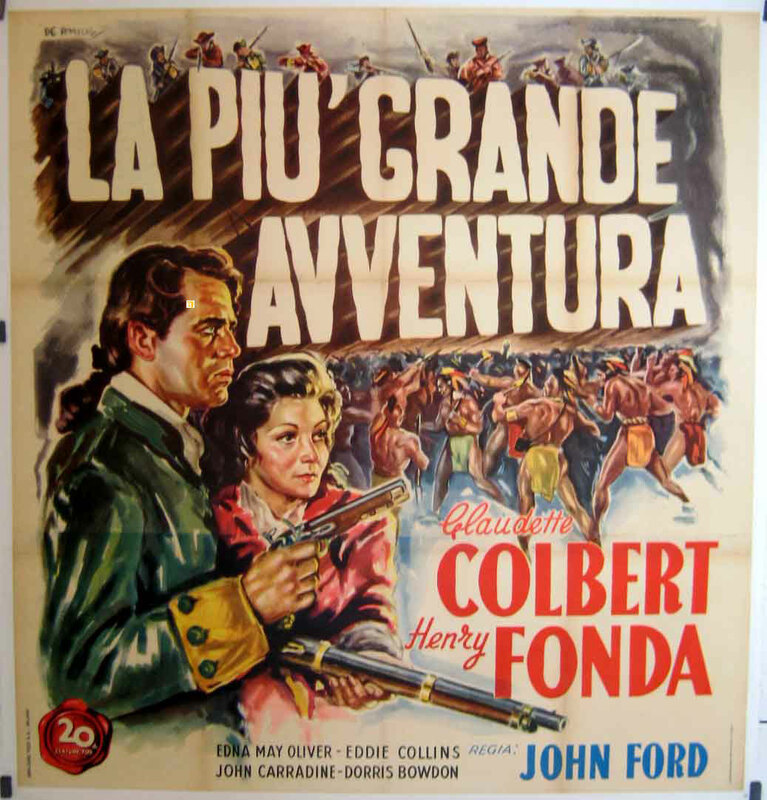 This entry was posted in Westerns Worth Watching and tagged Colonial Westerns, Henry Fonda, John Ford, Native Americans (Indians), Ward Bond on January 30, 2014 by Nicholas Chennault. Colonial settlers vs. Indians but mostly against British authority in western Pennsylvania in 1760 in this fictionalized account of the historical Captain James Smith and his Black Boys. 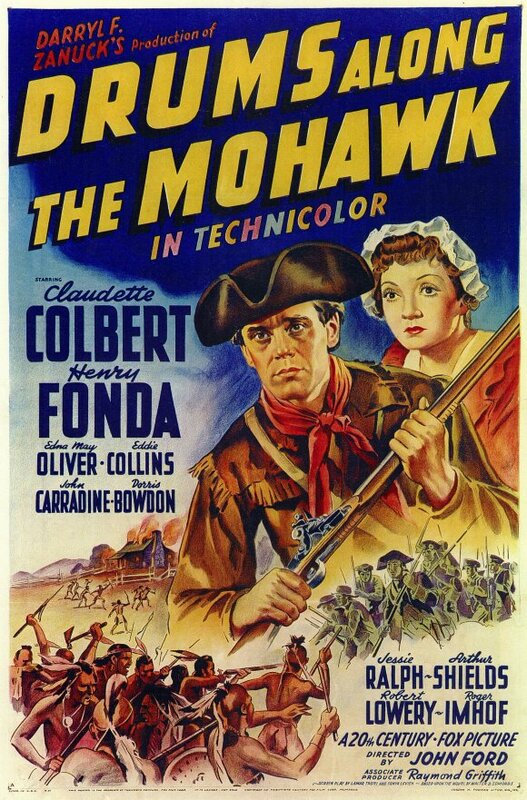 Released the same year as Trevor and Wayne appeared together in Stagecoach (it was the first movie they made after Stagecoach) and John Ford made the similarly-themed and bigger-budgeted Drums Along the Mohawk, this has been much more obscure and is seldom seen these days. At the start of the film, Smith (John Wayne) and a friend are returned from captivity with the Indians after three years. Although the French and Indian War has just ended, Smith finds that unscrupulous traders Callendar (Brian Donlevy) and Poole (Ian Wolfe) are trading weapons and firewater to the Indians, despite the fact that the Indians will use those supplies to kill both settlers and British soldiers. Smith leads his Black Boys to circumvent blinkered British military authority, as represented by officious and hostile Capt. Swanson (George Sanders). They take Fort Loudon from Swanson and capture the illicit supplies there. They again take the fort to release colonials unjustly imprisoned in manacles by Swanson. Callendar kills Smith’s best friend Calhoon (Moroni Olsen) and charges Smith with the murder. He declines to be released by a mob and ultimately is acquitted. 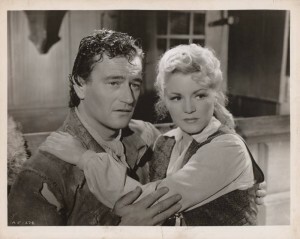 At the end of the movie he goes off to survey Tennessee with the lovely and spunkily tomboyish Janie MacDougall (Claire Trevor, mostly in anachronistic pants) in his wake. In what is kind of an extraneous and loud role, she has spent the movie trying to get him to re-commit to a promise made years earlier, before his captivity, to marry her. He never really does, although he seems closer at the end of the film. Swanson is depicted more as rigid and unthinking than bad and gets sent home to England at the end of the movie. 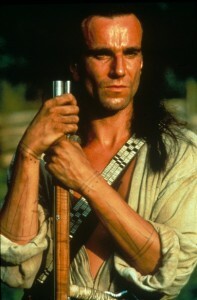 Robert Barrat, who had played Chingachgook in 1936’s Last of the Mohicans, is the local magistrate who sympathizes with Smith and the settlers. Wilfrid Lawson is MacDougall, Janie’s Scottish heavy-drinking, Indian-scouting father. It’s not very politically correct for our time, what with the heathen savages (“the only friendly Injun’s a dead Injun”) and “a man’s gotta do what a man’s gotta do” attitudes. It also partakes of 1930s populist sentiments. It looks like it was shot in southern California, not Pennsylvania. It’s pleasant and watchable, but perhaps not all that memorable. This was a good year for Brian Donlevy’s villainy: he was the sleazy saloon owner in Destry Rides Again and the sadistic Foreign Legion sergeant in Beau Geste in 1939 as well. Chill Wills has an early film role here, moving on from his musical group the Avalon Boys. In black and white. This entry was posted in Westerns Worth Watching and tagged Claire Trevor, Colonial Westerns, John Wayne, Selling Guns to the Indians on January 22, 2014 by Nicholas Chennault. Set on the Kentucky-Ohio frontier, either before or shortly after the American Revolution—the exact time is not clear. David Harvey (William Holden) is a still-bereaved widower with a young son Davey (Gary Gray), isolated on a remote farm. Prodded by his hunter-friend Jim Fairways (Robert Mitchum), Harvey decides to travel to the stockade and see if he can find a new wife. He finds Rachel (Loretta Young), now a bondservant because of her father’s debts, with whom a Mr. Green is willing to part for $18 dollars plus $4 more in the fall, even though that’s a very steep discount from what he paid. Since it would be inappropriate for the man and woman to live under the same roof otherwise, they are married before leaving the stockade. The problem is that Harvey is still grief-ridden over his first wife’s death and thinks of Rachel as a bondservant more than as a wife. He doesn’t try to talk with her much or develop the relationship. The marriage is not consummated, with the two parties sleeping apart. Arriving at her new home. The plot bears noticeable similarities to Young’s better-known (and more complex) The Bishop’s Wife, in that her husband fails to notice her good points until Fairways returns and finds her interesting. Whereupon she blossoms; she was always beautiful (being Loretta Young), but it now comes out that she’s educated, has musical talent (she can play the piano) and has taught herself to shoot as well as Harvey’s first wife did, for whom Harvey and Fairways were once romantic rivals. Pushed by Fairways’ interest, Harvey is more open about his own developing romantic interest, leading to a fight between the two males. Rachel decides to leave, but fate intervenes in the form of a Shawnee war party. Together the three of them hold off an attack by Shawnees on the homestead and it looks like they’re about to succumb to fire. We know how all this romantic (or determinedly non-romantic) stuff will turn out; the interest is in how the characters will get there. For a similar setting with a more rollicking story, see Many Rivers to Cross. This is better than that one, and better than average, mostly because of the excellent (if small) cast. Young really makes it all work by her restraint, although she seems older than the 25 she gives as her age. (She was 35 at the time. A year past The Farmer’s Daughter, for which she won a Best Actress Academy Award, she was at her peak.) There is also a question about whether Fairways is completely serious in his interest; he may just be prodding Harvey to help him out again. Still, it’s one of those situations where there would be no plot if these people (Harvey and Rachel) would just talk with each other. Fairways romancing Rachel with music. Mitchum comes off as a more attractive character here than Holden, who spends most of the film seeming stiff and grumpy. Maybe part of that’s how the parts are written. You could easily see Van Heflin in the Holden part, too. Mitchum’s singing voice proves to be pleasant enough. It’s unclear who the stranger of the title is—presumably Fairways? 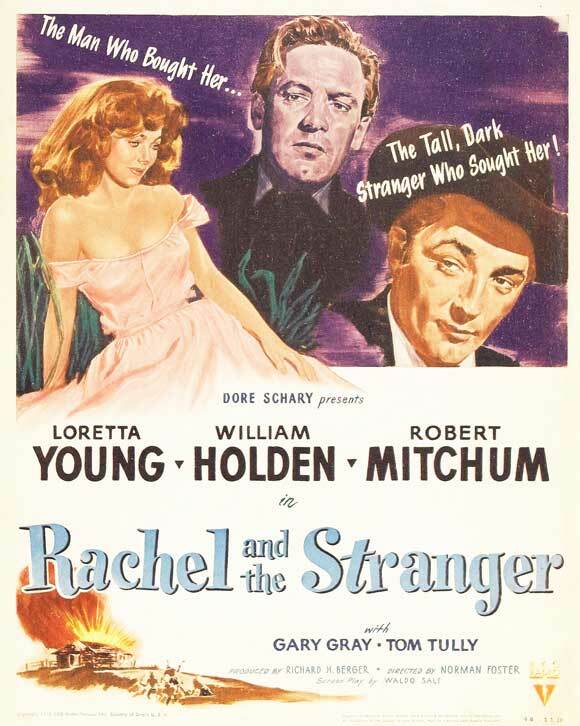 But Rachel’s new husband is also a stranger to her. And Rachel is never given a last name, other than “Mrs. Harvey” once she is married. 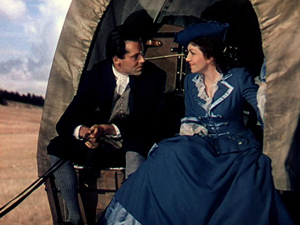 If you like Loretta Young in this western, try her in the 1945 sort-of-comedy with Gary Cooper, Along Came Jones. She plays a strong woman in that one, too. Some see similarities to Rebecca, with a new wife living in the shadow of the now-deceased first wife and a conflagration at the end. There might also be thematic similarities with The Sound of Music. But that could also be over-analyzing a fairly simple and straightforward film. 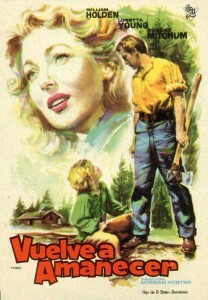 Based on a story by Howard Fast; screenplay by Waldo Salt. In black and white. Filmed around Eugene, Oregon. Short, at 83 minutes. 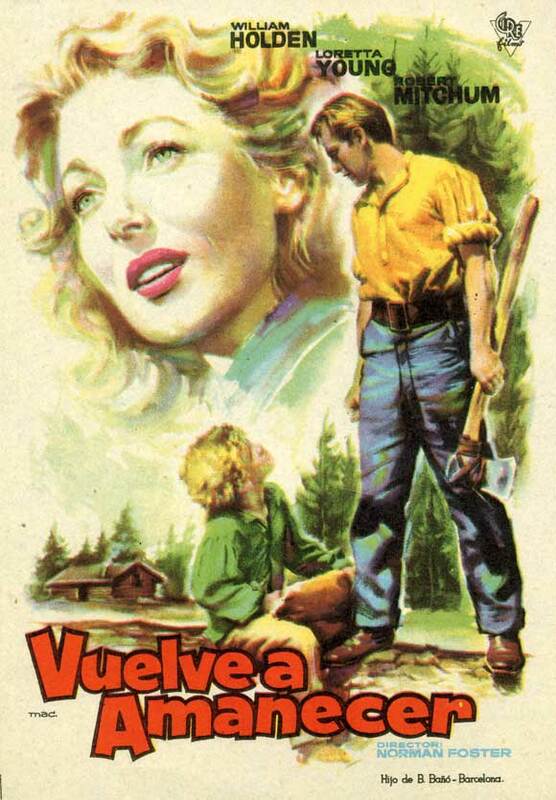 Despite its low budget, the film became RKO’s most successful film of 1948, making over $350,000. Released briefly on DVD in 2008, it now has very limited availability. This entry was posted in Westerns Worth Watching and tagged Colonial Westerns, Loretta Young, Native Americans (Indians), Robert Mitchum, William Holden on November 22, 2013 by Nicholas Chennault. 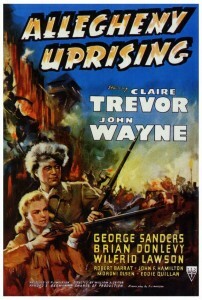 The official 1936 movie poster uses a 1919 N.C. Wyeth illustration from the book (upper left corner). 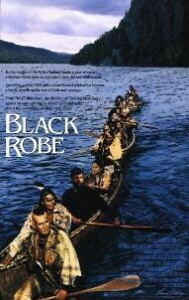 The successful 1992 version of this story was said to be have been based more on this 1936 movie than on the novel by James Fenimore Cooper. There are several lines from this version that recur in the 1992 movie and the 1936 screenwriter Philip Dunne even has a credit in the 1992 film, but the two versions are not identical in plot. Col. Munro (Hugh Buckler) is at Albany, about to head for Fort William Henry on Lake George, when he is joined by Major Duncan Heyward (Henry Wilcoxon) and Munro’s two daughters, Alice (Binnie Barnes, with dark hair) and Cora (Heather Angel, blond). 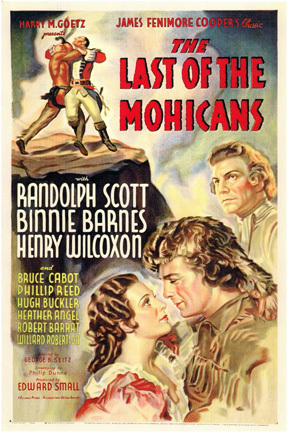 Their column is led by adopted Mohawk Magua (Bruce Cabot), who talks Heyward and the Munro daughters into taking a short cut on which he plans to betray them to the invading Hurons. The small party is rescued by Hawkeye (Randolph Scott) and father and son Mohicans, Chingachgook (Robert Barrat) and Uncas (Philip Reed). While making for Fort William Henry, they steal canoes and elude the Huron pursuit. Hawkeye and Alice begin to form a relationship, to the irritation of Major Heyward, as do Uncas and Cora. Once at the fort, the British are besieged by the French, Hurons and Ottawas. Uncas makes an unsuccessful attempt to carry a dispatch to Gen. Webb and is wounded. Hawkeye tells the colonials their homes and farms are in danger and helps them to escape the fort; for this, he and Chingachgook are put in the fort’s brig. Montcalm, the French commander, persuades Munro that further resistance is hopeless, and Munro surrenders on the promise of honorable terms and treatment. Magua whips the French-allied Hurons and Ottawas into a murderous frenzy, and the Indians attack the now-vulnerable British before they are able to leave the fort. The French are horrified and eventually put a stop to the massacre, but not before Magoa makes off with Alice and Cora and heads north. 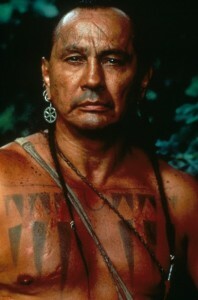 Hawkeye and the Mohicans escape the brig in the melee and head after Magua, encountering Major Heyward on the trail. Magua brings the sisters to the Huron council, where it is decided that Alice will die by being burned to death, and Cora is given until morning to decide between joining her sister in death or becoming Magua’s squaw. Uncas sneaks into the camp and rescues Cora, but Magua pursues. 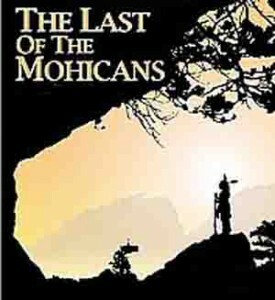 Uncas is killed by Magua and Cora chooses death rather than be taken again by Magua. In turn, Chingachgook kills the evil Magua. Hawkeye and Major Heyward argue over who will volunteer to trade himself for Alice. Heyward knocks out Hawkeye and steals his clothes; the Hurons agree to trade Cora for the disguised Heyward. Hawkeye shows up and has a shooting match with Heyward to prove who is the real Hawkeye; he ends up being tortured and prepared for burning. 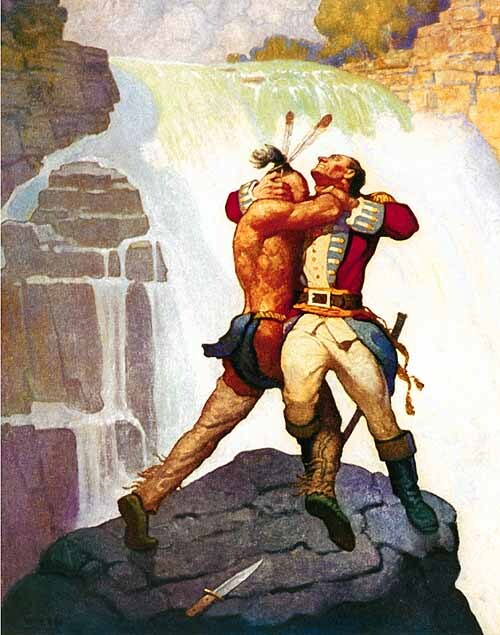 As the Mohicans, Heyward and Alice escape, they find a relief column near and return in time to save Hawkeye. Once back in in Albany with the relief column, Hawkeye faces a court martial for the same changes for which he was imprisoned at Fort William Henry, but this time Heyward comes to his defense. He is acquitted of all charges in return for joining the British army as a scout in their next expedition northward. So the blond and dark Munro daughters are switched in this version; the canoe chase takes place before the fort surrenders, Major Heyward surivives, and Hawkeye joins the British army. These are all changed in the 1992 version of the story. But this version deserves to be regarded as a classic. Scott is excellent as Hawkeye in one of the best of his early screen roles, and Wilcoxon does very well as Heyward. The sisters are also excellent. Cabot as Magua is neither as evil and leering as Wallace Beery (1920) nor as implacably cruel as Wes Studi (1992). But this is well worth watching, despite a couple of clunky spots. It was filmed in the Crescent City and Smith River areas of northern California, using Yurok, Hoopa and Tolowa extras. The first film version of Last of the Mohicans was a 1911 one-reeler starring James Cruze, better known these days for directing the 1923 silent western classic The Covered Wagon. The silent version most often seen these days is Maurice Tourneur’s 1920 version. That same year there was a German version of the story featuring Bela Lugosi as Chingachgook. Bedford and Roscoe as the young lovers Cora and Uncas. 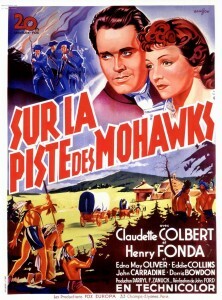 This Tourneur version is notable for Wallace Beery’s leering performance as the evil Magua, for the prominence of Uncas (Alan or Albert Roscoe) as the romantic hero, and for the strangely hayseed depiction of Hawkeye (Harry Lorraine), giving him a much less prominent role in the drama than this character usually has. 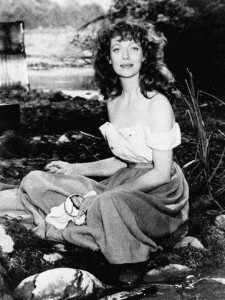 The romantic leads of Roscoe and then-17-year-old Barbara Bedford (Cora) were later married. Boris Karloff is said to be one of the Indian extras in the film, but if so he’s not very obvious. This was filmed around Big Bear Lake and the San Bernardino National Forest in southern California, with some shooting in Yosemite. The directors are top-quality: Tourneur did most of the movie, but after being injured on the set, he gave Clarence Brown one of his first directing chances in finishing the film and doing much of the outdoor shooting. The restored print has a lot of color tints in it. This version is one of the three (1920, 1936, 1992) most worth watching and is said to be truer to Cooper’s novel than most later versions. At 73 minutes, it’s not terribly long. 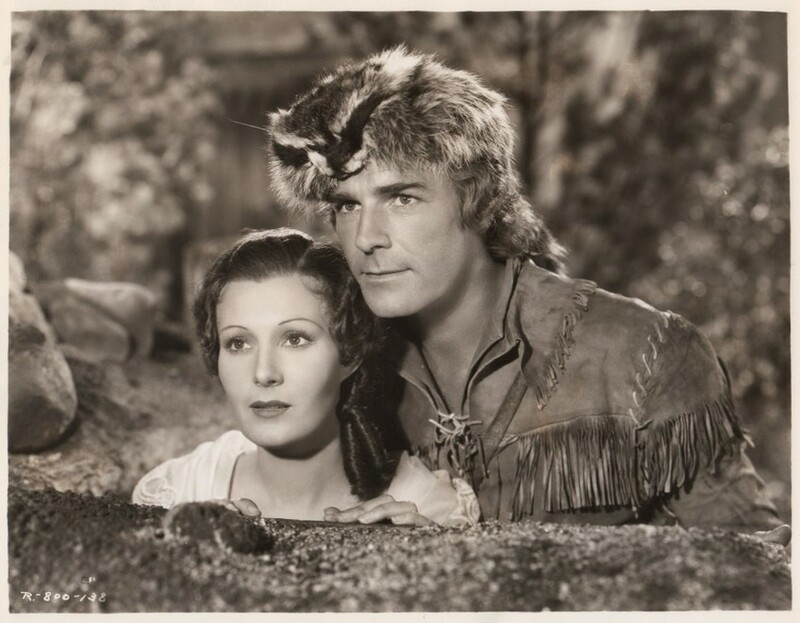 This entry was posted in Westerns Worth Watching and tagged Colonial Westerns, Native Americans (Indians), Randolph Scott, Wallace Beery on November 19, 2013 by Nicholas Chennault. Epic version of part of Kenneth Roberts’ 1936 novel about Rogers’ Rangers and their most famous exploit, the raid on the Abenaki settlement at St. Francis in October 1759 during the French and Indian War. More than half the Rangers died on their grueling return from the raid through very wild country teeming with French and their Indian allies. 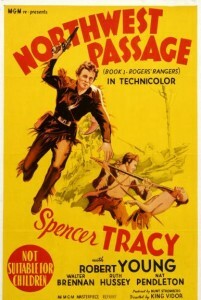 The subtitle of the film is Book One: Rogers’ Rangers. A sequel was planned but never made, showing Rogers’ deterioration and descent into debt and alcoholism in England after the war, as a loyalist increasingly out of tune with more pro-American colonists. During arduous filming in northeastern Washington, Tracy came to loath director King Vidor and swore he’d never work with him again. The film’s music features the old English army tune “Over the Hills and Far Away,” later used in a similar fashion in the Sharpe series set in the Napoleonic wars. 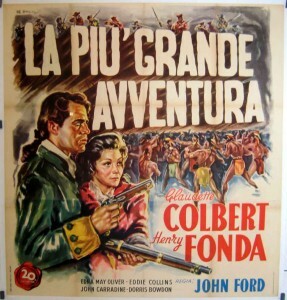 The posters emphasize Indian-fighting, the epic scale of the story, and its connection with the best-selling novel by Kenneth Roberts. Young Harvard-educated (until he is expelled) artist Langdon Towne (Robert Young) and his friend Hunk Marriner (Walter Brennan) get in trouble in their native Portsmouth, New Hampshire, for making seditious comments about a local English official (Montague Love). To avoid jail, they leave for the west. 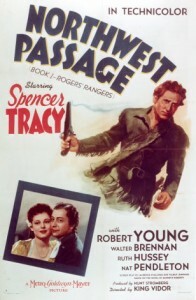 They join Major Robert Rogers (Spencer Tracy), who offers them the chance to go farther west and paint Indians if they become Rangers and go with him on a raid north into French territory and make maps. Trying to avoid detection by the French, the Rangers make their way arduously northward from the English fort at Crown Point, at one point portaging their boats laboriously over a mountain and at another wading through interminable swamps. The St. Francis Abenaki village the rangers are hitting is not just a peaceful Abenaki settlement. It has been used for decades as a base for raids by French-allied Indians (Abenakis, Hurons, and Catholic Mohawks) on frontier settlements in the colonies farther south in English territory. Most of the rangers have experienced the effects of these raids, and the objective is to hit it hard enough so that it won’t be used as a base for future guerrilla activity. According to Rogers’ subsequent report, the rangers found 600-700 scalps fluttering in the breezes at St. Francis. Lord Jeffrey Amherst, the British commander, also wanted to divert French military attention and resources from James Wolfe’s army at Quebec. The rangers arrive at St. Francis and are successful at their military objective in a harrowing sequence, but they find none of the food they had counted on for their difficult return by a different route. Towne receives a wound to his midsection, and they gather white captives for the return by way of Lake Memphremagog. Against Rogers’ advice, they vote to break into four groups for the return trip. French and Indians pick off some; injuries, starvation and madness take others. Out of the 142 Rangers, only about 50 make it to the rendezvous at Eagle Mountain. Straggling into Fort Wentworth where they expect finally to find provisions and support, they instead find it abandoned. But it isn’t long until a British unit headed in most unlikely fashion by Lord Jeffrey Amherst (Lumsden Hare) himself marches in, replete with supplies. 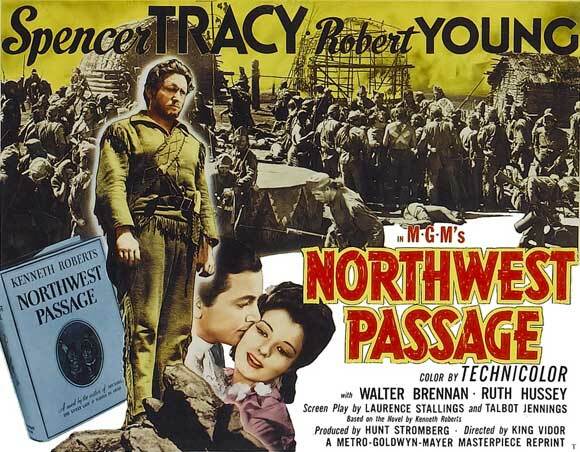 Towne goes back to his girlfriend (Ruth Hussey), and the Rangers march off to the west, supposedly in search of the Northwest Passage across the continent. Tracy is superb as Rogers, an inspiring leader who carries our attention and commands respect throughout the movie. He didn’t actually make westerns, though; the closest he ever came again was in the excellent Bad Day at Black Rock, set in the modern west, in Broken Lance and in the range melodrama The Sea of Grass.. Brennan is good and Young pretty good as the two regular characters whose story we’re following. Addison Richards is also good as an officer who becomes unhinged after the brutality on both sides. Ray Teal and Hank Worden have uncredited early roles as Rangers. 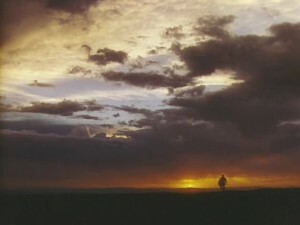 Much of the film was shot outdoors on location in eastern Washington and the Payette River in Idaho, and it shows on screen. Shot in color (rare for 1940), this film was nominated for an Oscar for cinematography. It was also long for its time, at more than two hours. It finally became available on DVD in Dec. 2011. The title hasn’t much to do with the events or subject matter of the movie; it refers to where the Rangers are headed at the end of the film. However, it probably had to be the same as the best-seller on which it was based. 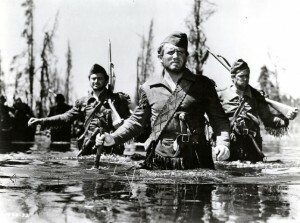 Compare the plot with Errol Flynn’s World War II movie Operation Burma a few years later. The racial attitudes will appear dated to the sensibilities of viewers more than 70 years later. But they weren’t much questioned in 1940, and they were even stronger in the era depicted, 200 years earlier, when many frontier dwellers had been subjected to Indian raids and atrocities. Viewers who can’t put themselves into the perspective of other historical times may have trouble with this. 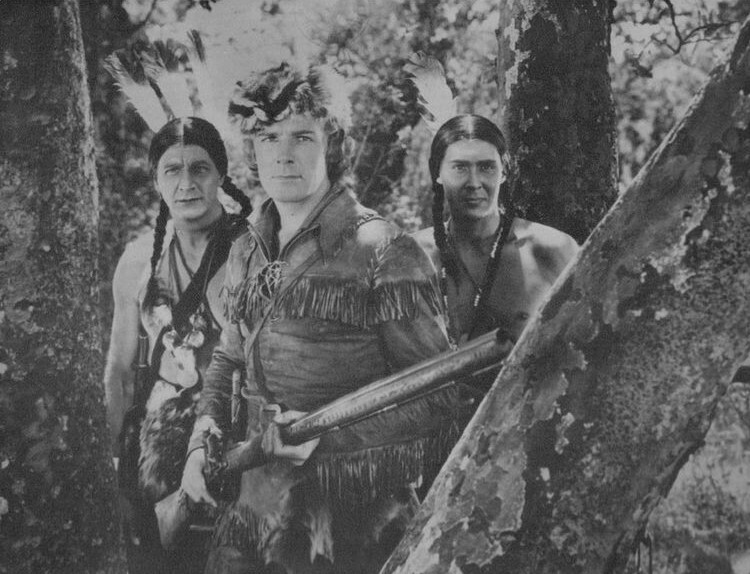 The Indians are mostly stereotypical, with Konkapot as the head of Rogers’ Stockbridge Indian scouts not given much to say and little screen time. Indian tortures and atrocities are described, but not shown. At St. Francis, almost all of the Indians shown are men of fighting age, not the women and children who would also have been present. The Indians generally look like plains Indians, rather than their eastern woodland counterparts, especially as they would have dressed late in the year. The whole idea of slaughtering Indians, admirable in the 1930s, is almost unthinkable today. Modern animal rights enthusiasts wouldn’t care for the way Rogers silences a barking dog in the Abenaki village, either—with a thrown hatchet. The movie makes compelling watching if you can get past current social attitudes, though. This and 1992’s Last of the Mohicans are probably the best movies about the French and Indian War and this phase of American frontier history. Lord Jeffrey Amherst here is shown more positively than he is generally remembered these days. Sir William Johnson’s Mohawks are depicted as unreliable, duplicitous and shifty; Johnson usually gets better press now. It is true that the actual Rogers didn’t get along well with Johnson, and was regarded with suspicion by the British army structure within which he served. As depicted, the Indians did call him White Devil. There have been a couple of good biographies of the father of U.S. special forces in recent years: see White Devil by Stephen Brumwell (2006) and War on the Run by John F. Ross (2009). Roberts’ pro-American novel with 1930s attitudes is also good reading, although long out of print now. Roberts was reportedly horrified at the movie, however. As a Loyalist (or Tory), Rogers was responsible for uncovering American spy Nathan Hale during the Revolution, with which he disagreed. He was an American type: the frontiersman competent and feared while fighting Indians and exploring terrain in the wilderness environment where he felt at home but out of touch in other more civilized surroundings (see George Rogers Clark, Daniel Boone, Davy Crockett, Jim Bridger, Kit Carson, maybe even Meriwether Lewis). It makes Andrew Jackson seem more admirable, as one who could function well in several worlds. Not to be confused, or even connected, with Southwest Passage (1954). This entry was posted in Westerns Worth Watching and tagged Colonial Westerns, Native Americans (Indians), Spencer Tracy, Walter Brennan on October 8, 2013 by Nicholas Chennault. Strictly speaking, this is not a western, since it is set in upstate New York during the French and Indian War of the 1750s. But it’s a frontier story involving Indians, guns and battles for survival, and it has the great themes of personal independence, self-sufficiency and understanding nature that frequently come with westerns. It’s a visually beautiful movie that was actually filmed in North Carolina, since New York apparently no longer has the kinds of green spaces, old-growth forests and untrammeled vistas this movie required. The story for this movie perhaps owes more to the 1936 film starring Randolph Scott than to the original novel by James Fenimore Cooper, which is the original source material for both film versions of the story. 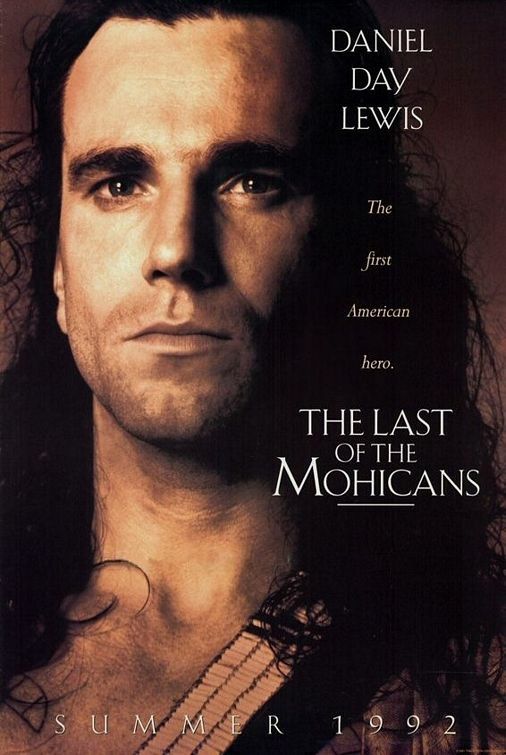 The movie’s central event is based on an actual historical incident (the treacherous slaughter by the French and their Indian allies of English forces after the English surrender of Fort William Henry), but most of its central characters are fictional. Fictional or not, however, Hawkeye (here given the name Nathaniel Poe), with one foot in the world of whites and the other among the Indians, is one of the most enduring and fascinating characters from American fiction and movies. Daniel Day-Lewis is one of the most acclaimed actors of his time. He’s very intense, and there are people who enjoy him in this role but find him hard to watch in other movies. This is probably the best movie featuring the beautiful Madeleine Stowe, cast here in the role of older sister Cora Munro. And the supporting roles are among the very best ever played by Indian actors (Wes Studi, Russell Means, Eric Schweig), along with Chief Dan George’s performance in The Outlaw Josey Wales and Graham Greene in Dances With Wolves. Russell Means, in particular, is well-managed, because he isn’t really much of an actor but is effective here. Wes Studi’s evil villainy as Magua is truly impressive. Stephen Waddington is appropriately loathsome and officious as Major Duncan Heyward, until his final redemption is accomplished through an act of self-sacrifice. The battle scenes are excellent, showing very clearly how traditional British military tactics didn’t work at all against Indian-style guerilla fighting. It’s very hard to stage and film the flow of individual incidents among the confusion of a more general battle, and in this movie that’s done very well. In all other versions of this story, Col. Munro is saved by Hawkeye and survives the massacre, but in this one he is killed. The movie is rated R because of these battle scenes (and other violence), and they are harrowing. 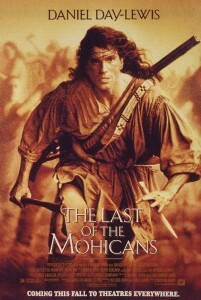 There are some pacing problems with the last part of the movie, as Hawkeye, Chingachgook and Uncas relentlessly pursue the Hurons who have taken Heyward and the Munro sisters captive. One can’t tell how long the pursuit is, but presumes it would actually be days or weeks, at least, since the slaughter took place in upstate New York but the Hurons were based to the north in Canada. In this movie, it might be days or weeks, or it might be an afternoon. The theatrical release of the movie felt like the story, especially the last part, would benefit by a longer cut. Mann’s original cut was three hours long, but Fox insisted that it be cut to two for its theatrical release. Jodhi May, playing younger sister Alice Munro, has said that much of her role disappeared in the cutting room. In the DVD age, however, a director’s cut has been released, and it’s not any more intelligible or flowing (or even much longer) than the original. Still good to watch, though, and it’s the only version available on DVD in the U.S. as of this writing. One would like to see the three-hour version some time, although longer is not always better. And many prefer the original theatrical release to the DVD director’s cut. This movie is unusual for a director known best for modern urban crime dramas. The movie has excellent music as well, with a celtic-influenced soundtrack by Trevor Jones and Randy Edelman. The fiddler is the famous (if uncredited here) Scot, Alasdair Fraser. 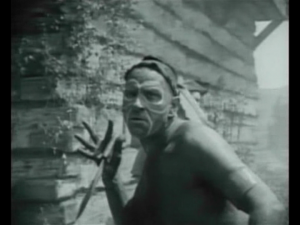 The first cinematic version of this story was made in 1911. 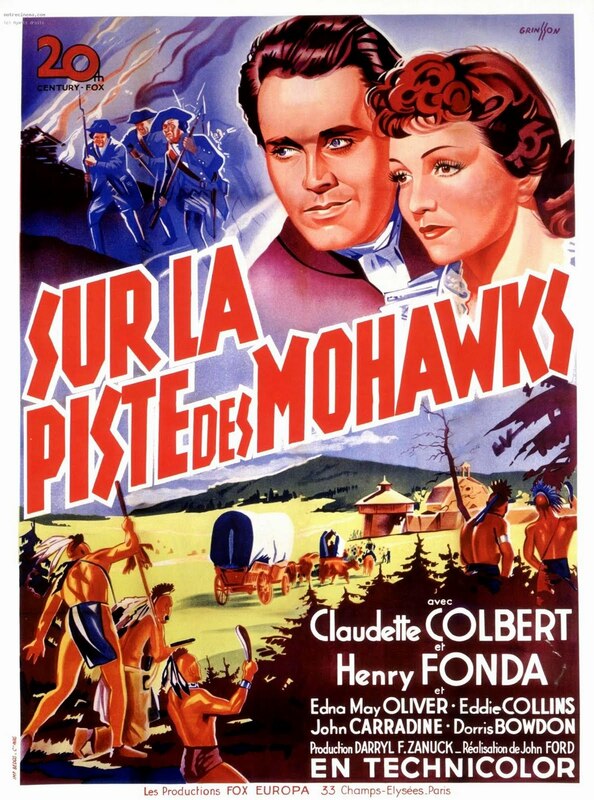 For a bit of perspective after you’ve watched this one, check out the 1936 version with Randolph Scott and, as a cultural curiosity, the 1920 silent version, featuring Wallace Beery as a leering Magua, a noble Uncas as the central figure and a strangely hayseed version of Hawkeye. This entry was posted in 55 Greatest Westerns and tagged Colonial Westerns, Native Americans (Indians) on August 4, 2013 by Nicholas Chennault.